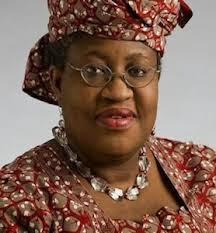 Dr. Ngozi Okonjo Iweala, the Minister of Finance and Coordinating Minister of the Economy laid the 2014 budget estimates separately before both chambers of the National Assembly on Thursday in an event devoid of speech making and other ceremonies associated with similar events in the past. The Finance Minister who was accompanied to the National Assembly by a retinue of her colleagues in the Federal Executive Council first laid the budget estimate at the Senate after a motion moved by Senator Ndoma Egba, the leader of the Senate and seconded by Senator George Akume of Benue State. Okonjo-Iweala laid the budget before the Senators after which her and her entourage was discharged from the National Assembly and the Senate continued with its other businesses in a process which lasted less than five minutes. In the same vein, Honourable Mulikat Akande, moved the motion to allow the Finance Minister to lay the budget before the Representatives at the lower chamber. There was however a bit of rowdiness as lawmakers from Peoples Democratic Party and All Progressives Congress engaged in a shout of their party slogans. Okonjo Iweala and her team were therefore discharged after she had laid the budget on the table. There were no comments from the Speaker of the House of Representatives, Honourable Aminu Tambuwal or the President of the Senate, David Mark about the budget who presided over the event in both chamber. Also, the details of the budget estimates submitted by the Finance Minister have not been made public as at the time of filing in this story.